It has taken me three weeks of soul searching to decide if I should post this on my blog. This is a very personal account and it’s difficult for me to put it out here for the whole world to read. I finally decided to go ahead with it because I’ve been quite open about everything thus far and maybe, through the sharing of my journey, I can help someone else who might be experiencing something similar. As many of you know I underwent a PCI in March 2014. I had a blockage in a small artery and it was discovered, thanks to having a fit lifestyle, before there was a heart attack or any damage. Time passed and I tried repeatedly to train for races earlier this year. I couldn’t seem to train well. I knew I had lost cardiovascular ability but I assumed it was just because I hadn’t run enough. My blog posts spoke of anxiety when I ran but it wasn’t anxiety and what happened next was a bit of a shock to both my doctors and to me. 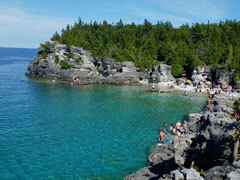 The first week of August we vacationed at Bruce Peninsula National Park. The first night at Cyprus Lake was simply awful. I had aches in my right arm that I attributed to shooting a 9mm at the range a few days before. I felt fatigued all week but continued to enjoy hikes on the rugged shorelines of Georgian Bay. I had been burning the candle at both ends for weeks so I chalked the exhaustion up to that and pushed through. My neck and left shoulder were a little sore but I figured that was from sleeping on the ground in a backpacking tent. We ended up having a wonderful week and the fatigue eventually passed. We came home, unpacked, and started to settle back into our routine. Early Sunday morning (August 9th) I went to the gym with Carla. I overslept and basically grabbed an energy bar on my way out the door. I wasn’t feeling the best but I figured a good workout would energize me. I did my usual warm up on the bike but it was much slower than usual. Then we did upper body with free weights before going to the machines to do legs. When I was on the leg press machine I had some mild heartburn which I attributed to the energy bar and being in a reclined position. I was quiet on the ride home which is unlike me. When I got home the heartburn wouldn’t go away even with multiple doses of an antacid. I went to lay down for a bit because the fatigue became extreme. Finally the heartburn stopped, nausea started, and I napped. I got up for a light dinner and felt slightly better but I was still beyond tired. At 11:20 pm I made the decision to get Bryan to drive me to the ER. I packed some essentials because my intuition told me this was my heart. I was admitted immediately and it was suspected, due to elevated Troponin levels in my blood, that I had suffered a very mild heart attack. What!? I thought maybe I was having warning signs but was utterly shocked that this was an actual heart attack. Where was the gripping pain? The sudden collapse? I mention this because often women don’t have obvious symptoms and a lot comes down to intuition. I knew things weren’t right and I had known since that night at Cyprus Lake. I was ticked. I had worked so hard since I started running to prevent heart disease from being such a big factor in my life, yet here I was. The next step was to find out why and I was admitted to the Cardiac Ward. Less than 48 hours after arriving at the ER I was transported to the Cardiac Clinic at Hamilton General Hospital to undergo an angiogram to see what was happening inside my heart. I was terrified and thought that I had done all this hard work for naught… thinking the heart disease has progressed. So, what was the cause? A new blockage? Not exactly. The original stents (two drug-eluting stents that overlapped) that had been placed in an offshoot artery last year had closed because of my body creating scar tissue inside the foreign object. This is called in-stent restenosis… bleh. I have other names for it! I was taken to the surgery for the angiogram and possible angioplasty. I’d been here before so I knew what to expect, however, the procedure wasn’t as simple as it had been for me in 2014. They had problems going through my wrist and had to abort because of oozing and resume by going through my femoral artery. That went well enough from what I can see in the surgery report. They fixed the restenosis by using something called a Pantera Lux Paclitaxel Releasing Balloon. This is a relatively new solution that has only been approved in Canada for a short time. It is a medication coated balloon that is used to open the stent back up. The balloon is inflated and then removed leaving the medication behind. After the surgeon did the angioplasty he came to talk with me. The doctor said he didn’t see any damage and his interpretation is that this was very severe angina and not a heart attack because there was no damage. When I questioned him about his opinion vs what the internist at Brantford General said, he put it this way… “If you gently bump another car in a parking lot and there is no sign of damage whatsoever is it still considered an accident? That depends who you ask.” Either way, it was a good thing I hadn’t delayed going to the hospital any longer than I already had. The surgeon also mentioned that an additional artery had started forming. Creepy. We all have these lying dormant in our bodies but because of a relatively active lifestyle one of mine came to life, so to speak, in order to compensate for the restenosis. He informed me that they couldn’t fix the problem with the blocked stent 100% because it also affected a secondary spot and that I may experience some some discomfort when I run but that if I could exercise through it this “new” artery will continue to grow. That could eventually eliminate the symptoms and improve my heart health even more. That seemed promising. Here’s where it got a wee bit scary. Three hours post-procedure the nurses went to remove the shunt from the artery in my leg and I started to hemorrhage. They applied pressure until the bleeding stopped. Then the ladies left the room and within 5-minutes I was screaming for them to come back because I now had a hematoma on my upper thigh the size of an American football. The nurses applied pressure to reduce that and tipped my bed so my head was at the floor. About this time I passed out so I’m not sure what happened next. When I awoke the nurse helped me to get up and walk around but the pain in my leg was excruciating. I looked down only to see one of the ugliest and biggest bruises I’ve ever had. Finally at 5 am I was transported back to Brantford. My bruising from the hematoma was so severe that they were concerned about micro-aneurysms and clots. I was sent for ultrasound on that leg and also for blood flow on my left leg. Everything came back inconclusive although they had a hard time seeing sections of the bruised thigh. The bruise went right up to my hip and was starting to creep down my leg. I had to find a balance between walking enough to prevent blood clots and dealing with the pain of a growing bruise. I managed. I had a few other issues while at the hospital and was finally released the afternoon of the sixth day. I was happy to be going home. When I arrived home I immediately called my own cardiologist to make a follow-up appointment. Rather than see me first and then send me for tests, Dr. J. decided that I should have a Cardiolite Exercise Test on the treadmill so I did that day before yesterday. The doctor didn’t pull me from the test but at almost 11-minutes I asked to stop because of hypoglycemia. Silly diabetes. Thankfully I had reached 87% of my maximum heart rate which was more than enough for their purposes as they only needed me to get to 85%. I felt good and it was really nice to run again but I won’t really know anything until I meet with Dr. J. next Tuesday. Then I will have a clear idea of where I am at with this and if there are further issues. So that’s the scoop. If this was indeed a heart attack it was uber-mild. Once again, I was very fortunate and listening to my body played a big part in this. I’m doing everything I can but I’m also battling genetics which makes this a really tough fight. I’m grateful that this was not a new issue in another part of my heart and that the disease has not progressed, as far as we know. I’m relieved that all the fitness and nutrition wasn’t for naught.